Wow, after all the September rains we were treated to about 6 days in a row of spectacular summer-like weather. Let's go to the Gunks! Annie and I drove Blanche down Wednesday night, slept in the stairmaster parking lot and got a good start Thursday morning. Thursday we got on Horseman, and Strictly From Nowhere, but the highlight climb for me was Snooky's Return whose first pitch is a thin crack. I found the crux to be right at the bottom but really enjoyed the entire line from there. Friday we were joined by Rosie and Brian and we all enjoyed another stellar day on the cliffs. Rosie savored her first climb of the classic High Exposure line, probably one of the best known climbs at the Gunks. Brian recommended I try The Last Will be First and, as promised, the climbing was great fun -some spicy face climbing with a slight lack of pro and a couple of fun roofs! CCK was next on the agenda and unfortunately I once again got freaked out about the unprotected crux on Pitch 2. Rich Gottlieb, owner of Rock and Snow, to the rescue (again!) This time however I pumped out while trying to work out the moves and the resulting fall was nothing to laugh about. SCARY! But again, due to my competent belayer Annie and the foresight to reduce the amount of rope out before the fall, I came away with just a minor ankle tweak. I re-climbed the pitch (thanks to Rich leaving me some extended pro above the crux) and we devoured the last, classic exposed pitch finish that everyone lives for. On Saturday the crowds for the Columbus Day holiday weekend descended upon the cliffs. It was so crowded Annie and I chose to take the long hike down to Sleepy Hollow and endure the hunt for a highly recommended beginner route Casa Emilio. Annie lead the top pitch with aplomb. Her crown jewel, however, was taking the sharp end on her first 5.6 trad climb - she sent Rhododendron! This is a great first 5.6 lead as it sews up nicely (being the crack that it is, with ample face holds to ease the grade). Way to go Annie! Sorry I couldn't take any photos while belaying! 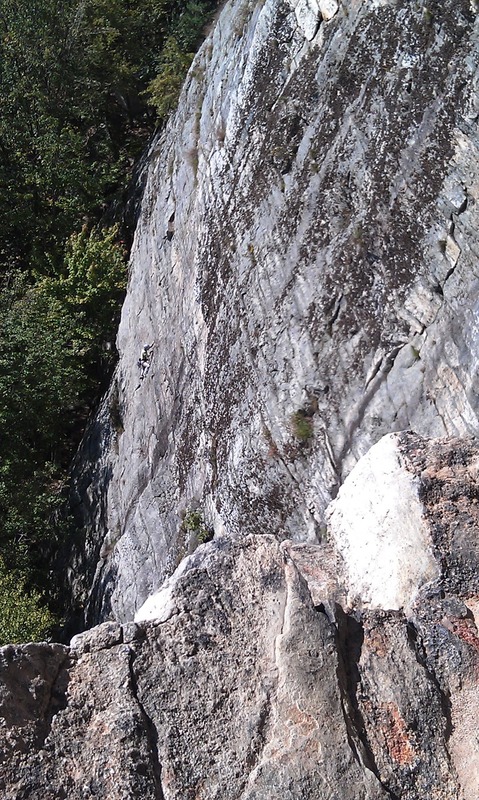 Sunday Annie ticked off another great lead, this time the multi-pitch line on Beginner's Delight. The route's name is somewhat misleading as beginning leaders have no place on this climb. There is a long traverse, a roof and route finding to boot! Annie had lead pitches 1 and 3 before and added the pitch 2 traverse to her belt notch this time. Thanks to Marie (our funny Canadian friend) for the photos! Note the copperhead on the red and grey pack! The weather was so warm the Copperhead snakes decided to make plentiful appearances. A Sunday snake visit came from the skies - a copperhead simply fell from some place above on the cliffs and landed on Annie's pack at the bottom of the climb. After some time it crawled from her pack to Rosie's pack before slithering away. The cooler weather ought to drive them back into hiding - I hope! Rosie took this pic with her phone from the High E ledge. This is Annie following a great route "The Last Will Be First"
Rosie! Well, it's not like we didn't see our share of real copperheads during the weekend, even if this one was a milk snake! When I turned 50 in August 2010, I had mixed emotions. 50 sounds and feels old - but it's all a matter of perspective. I decided to embrace it and follow my dream to drive cross- country on a climbing trip. I got my act together and planned the journey. 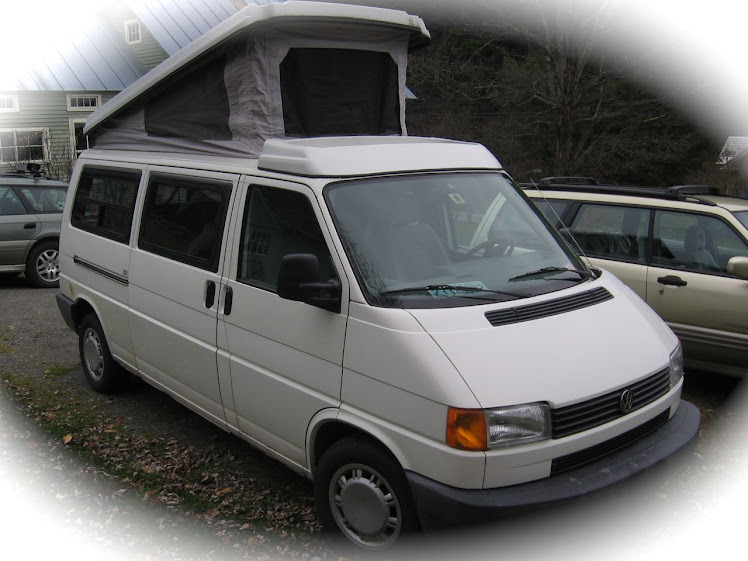 In May 2011 I left behind my work, comfortable home with my spouse and animals and hit the road for 3 months in our trusty 1995 Volkswagen Eurovan Blanche. I travelled across the US visiting family and friends, but rock climbing destinations steered my compass. I wanted to give back as much as possible, so please read the beginning of the blog to understand the objectives of that trip. I sometimes blog about other life events that impact me. A “crux” is defined as a decisive, pivotal point. The crux of a climb is the difficult part requiring problem-solving, effort and determination to pass successfully. I coined the word “cruxtopia” myself, to describe an uncomfortable place which is also savored as it is extremely rewarding to solve it. Climbing is the cornerstone of my posts, but I am never lost in the metaphorical significance. Please post comments and follow me on Twitter. Thanks for reading! Ethereal theme. Theme images by Sookhee Lee. Powered by Blogger.